Carlos Saura is one of Spain's most respected and influential directors, heralded in particular for his exploration and use of the art of dance in films. 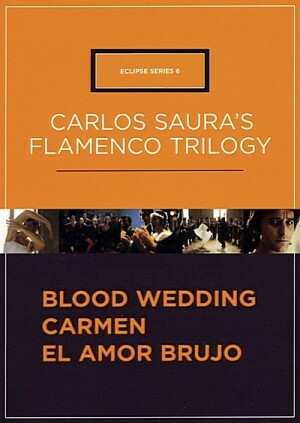 During the 1980s Carlos Saura moved away from his Franco-era political films such as Ana y Los Lobos (1973) and the sensational Cria Cuervos (1976) to focus on his lifelong passion for flamenco. Saura created a sumptuous trilogy examining this quintessentially Spanish element of Hispanic culture, using flamenco's rigidly choreographed dance routines and vibrant music to depict the powerfully emotive themes of romance and unrequited love. Carlos Saura's Flamenco Trilogy is a thrilling set of movies for dance fans, fans of Spanish culture and musical fans looking for something different. These pictures are a great affirmation of film as an excellent recording medium for dance. Saura approaches each of them with a different, wholly appropriate mode of stylization. The trilogy is a collaboration between Carlos Saura and Antonio Gades, Spain's top flamenco dancer and ballet director.